Hello and welcome to Webcomic Wednesday! Each week I take a look at a comic that inhabits the digital space, and let you know whether it is worth reading. This week I’m checking out a big one, its The Bunker, a new series courtesy of Joshua Hale Fialkov and Joe Infurnari. And it’s great. One issue in and I am sold. That doesn’t happen much – usually I wait until a few issues have dropped, and then I determine whether I will continue to pick it up regularly. 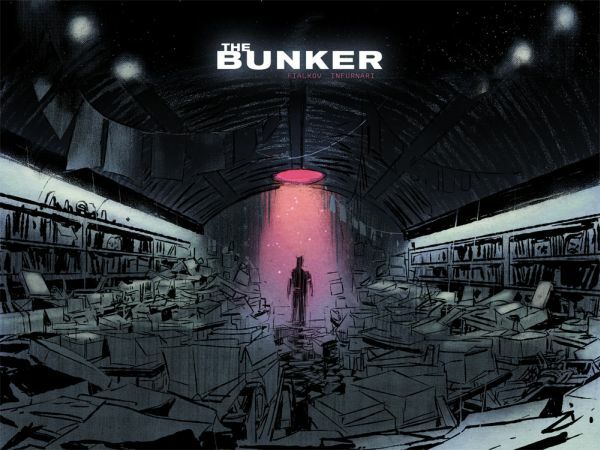 But I don’t need to with The Bunker, a unique blend of post apocalyptic fiction, with a healthy amount of time travel thrown in, has got me sold at the premise. But it is what ends up inside that is truly great. The story follows a small group of teenagers as they stumble onto a bunker with their names written on the outside – when they head inside they find documents, each with their names on them, and written by one of them. Without spoiling any more, there are a few twists in the first issue that will have even the most astute readers (read: Lost fans) surprised. That Lost reference is no mistake – this issue is soaked in mystery and intrigue, with a healthy dose of sci-fi. This series will be a talking point for fans as it moves along. It also helps with it’s incredible cliffhanger that made me more surprised than I thought I would be. Infurnari’s art is also great, a decent monochrome palate across a hand drawn landscape. It looks superb and despite the style, never feels too much or cluttered. It suits the story well, and that’s what matters the most. One issue. That’s all that it took for me to be hooked, and I’m sure you will be too. You can find the first issue here on their website, or over on Comixology. Don’t miss this, it’s going to be great. Got a digital based comic you want me to take a look at? Hit me up on twitter @Prudent_Pipes, or drop us a line on our via our contact form.